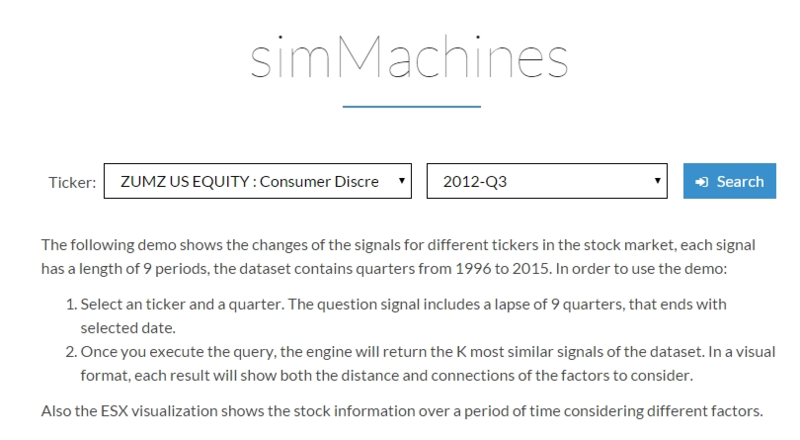 The following demo illustrates one method for simMachines’ technology can be used for predicting how a selected stock will change over time by comparing it to the movement of another stock over a particular period of time. Moreover this demo can be extrapolated to also provide real time predictions oh how each stock would change in the future as well. Standard factors such as Price, EV/EBIDA, Short Interest, 3 Month Volatility, etc are observed and compared.This demo would contain a graphical interface which compares the price of a selected company with the other firms. Most crucial factors used for determining and predicting the price are also displayed. Moreover, our engines have the ability to stretch the initial query signal to match historical data, allowing for a far more robust search. Visit the link at the bottom of the page to access the demo. 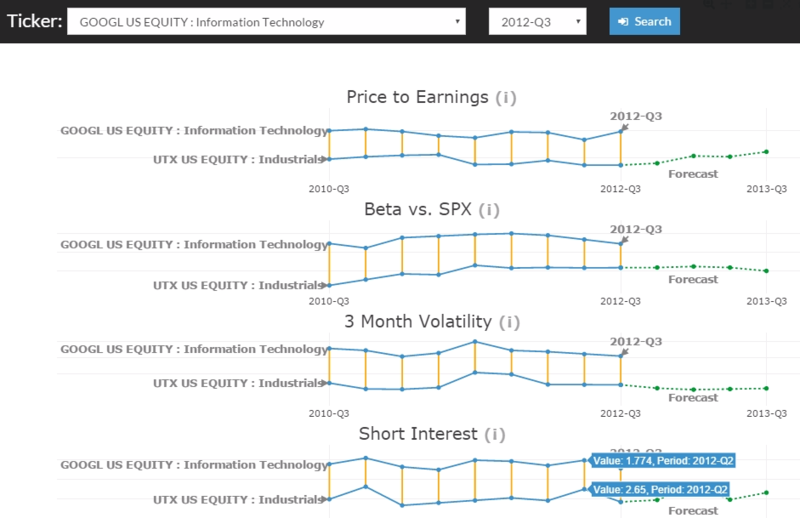 Select a Ticker of interest and its corresponding Quarter to be compared, and click on “Search”. For the purposes of this Demo, I have selected GOOGL. 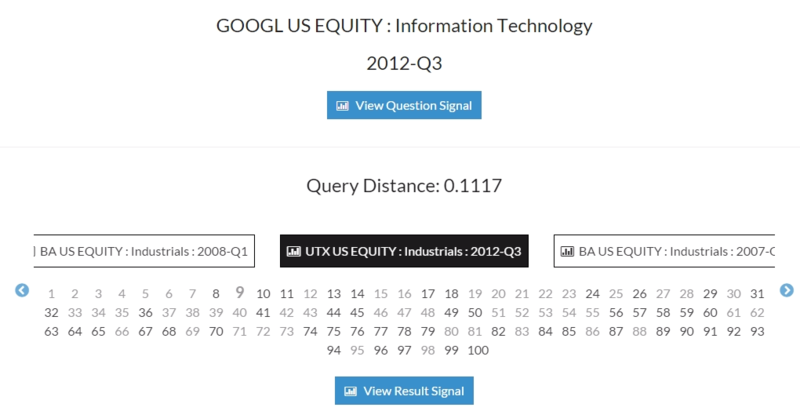 A graphical interface would be displayed with the GOOGL’s Price Forecast in the future. This forecast is computed using similar companies in the past and the range shown for the price provides a cushion/margin of prediction. Clicking on the “Price Graph” – “Details” bring up a popup box which displays GOOGL’s stock price in accordance with BA’s stock price. 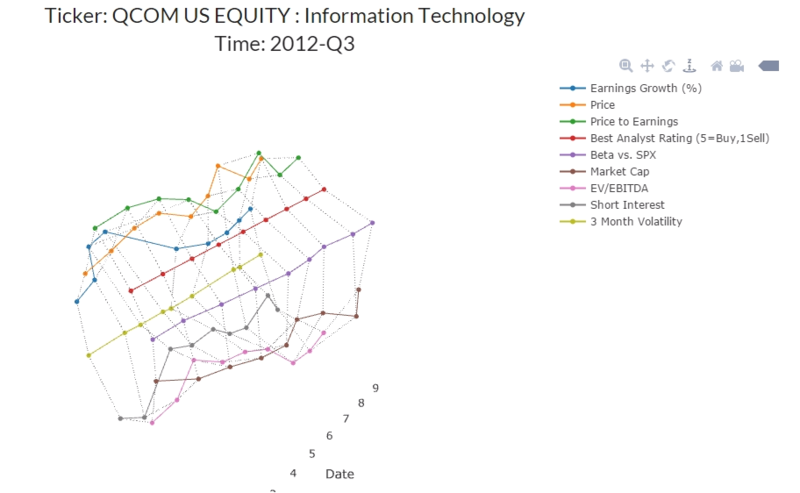 Following which, an assocaited forecast is made for the GOOGL’s stock price depending on how similar the companies are. Please note that this prediction is not made solely based on price trends, but other factors have also been taken into consideration. More details can be found below. Scrolling down displays the most similar company (and the associated period) in comparison to GOOGL. As we can see, the company with the strongest match for this example is BA 2008-Q1 and the strongest factors associated with this prediction are “Price to earnings”, “Beta vs SPX” and “3 months volatility”. Upon clicking on the “Factors” – “Comparison,” we can see all the individual factors our machine learning software used to make the stock price prediction of GOOGL. 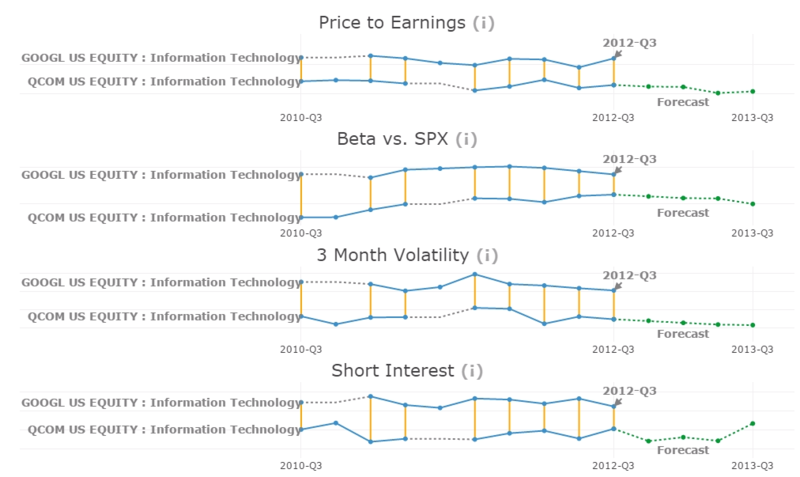 Each graph displays how similar GOOGL’s factors (Price to earnings, Beta vs SPX, 3 month volatility, Short interest, Price, Market Cap, etc) are compared to the other firms and the trend of the each factor is plotted in an easily comprehensible manner. A user can click and drag a box around a specific part of the signal to zoom in and analyse the signals in details. Double clicking on the same graph would return it to the default zoom level. Upon clicking on the “View Question Signal” or the “View Result Signal”, a user is able to see a 3-D visualization of all the Factors, spread across a few days (a hyper dimensional time series). This circular positioning of the helps demonstrate how each factor moves in tandem with one another when looked at over a period of time. Standard 2-Dimensional representations would not be able to capture the change in trend since each factor would have a different value, thus skewing a 2-Dimensional graph, whereas in the 3-D visualizations, the signals are placed next to each other for ease of comparison. Contact us to see the demo!